I purchased the charger to power up USB devices while on the road. My main concern was charging my HTC Hero phone that I use for gps, phone, camera and web posting. Yes, it is a power hog. In addition to the Hero, I have a iPod nano and a wireless phone mic that all need power. What was needed was a way to add power to these items when I was on the road. 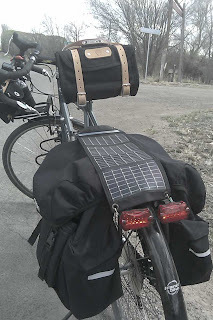 it would be real handy on long tours when attaching to the grid may not be an option. The charger actually charges 2 AA batteries in about 2 - 3 hours of direct sun. I take the charger out of the sun after the indicator shows the batteries have a full charge. To charge the iPod, I plug it into the USB port, and leave it for about 30 minutes and that pretty well charges it up. For the Hero, it has been somewhat of a challenge. Through trail and error, I have found the best way to add power to it. From the fully charged AA s , I plug the Hero in to the charger with the Hero powered OFF. I leave it connected to the charger for 15 minutes. That adds about 10 - 15 % charge to the phone. Leaving it connected longer does not seem to add more charge... in fact I have noticed that it often removes some charge. It is easy to add new rechargeable batteries to the device. The flexible panels make it portable and easy to attach to a rack or bag. I found it easy use, and swap out batteries when they are charged so that there are always power when I need to add power to my USB devices. It works ! Thanks for your comment about this solar charger. Based on your recommendation I have gone ahead and purchased the device... I'm actually holding it right now! You're doing exactly what I want to be doing: Riding a LHT. 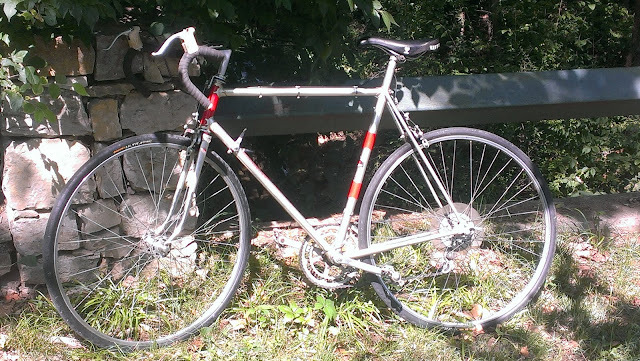 Now if I could just find a local shop that actually stocked the bike I would be all set. Hopefully I will have my LHT in the next month or so. Take care and I've bookmarked your site. The USB+AA solar charger I received does not seem to work. I've plugged devices into it and the only result thus far has been the device draining... which, per the instruction manual, is not supposed to be possible. Also, as soon as a device is plugged in via USB the batteries start to emit a high-pitch squeal. I've left messages for PowerFilm to call me back, nothing in the past week. This one will be going back to REI (which was the cheapest place to buy it). Have you had any problems with yours? The squealing battery? Draining a device? when using mine... I have not had a 'squealing battery". I am wondering if this may be an issue with the batteries. I have used a few different ones to have a number of them 'ready to go'. As for draining your device, I did have that happen if I left the device (phone) attached to it for more that one hour. One thing that I have found is that the batteries need to be fully charged (solid red light) before I attach my devices to it. Given your issue, I am with you,,, I would return it and see if they will exchange it. It is not a perfect solution but thus far it is adding power to my devices when I need it. It works better for the ipod than the phone. Yep, I've had the same problem. I contacted Powerfilm by email, and got a RMA. They told me in the email that they had to change the circuitry for some of the more modern cell phones. Lets hope it works!